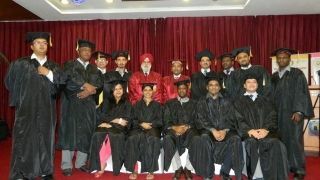 Graduation of F.MAS + D.MAS Batch May 2014 at Pacific Hotel, Gurgaon. More than 6500 surgeons and gynecologists crossed the World Laparoscopy Hospital fellowship commencement stage in past decade. The qualified laparoscopic surgeons and gynecologists including fellowship, master and diploma candidates received degrees. Future minimal access surgeon moguls proudly shook the hands of WLH faculties and received their hard-earned degrees with smiles on their faces ... and then they took selfies. To get graduates excited about the ceremonies and to capture the joy of the special day, the WLH team sought to expand the use of the WLH hashtag, which is a way of getting a large group of people talking about the same thing on social media platforms. A graduation ceremony is an event where the commencement speaker tells the other surgeon and gynecologists to get dressed in identical caps and gowns that individuality is the key to success. You are now trained minimal access surgeon. Your certification is in your F.MAS or D.MAS degree. You may think of it as the ticket to the good life. Let me ask you to think of an alternative. Think of it as your ticket to change the world.